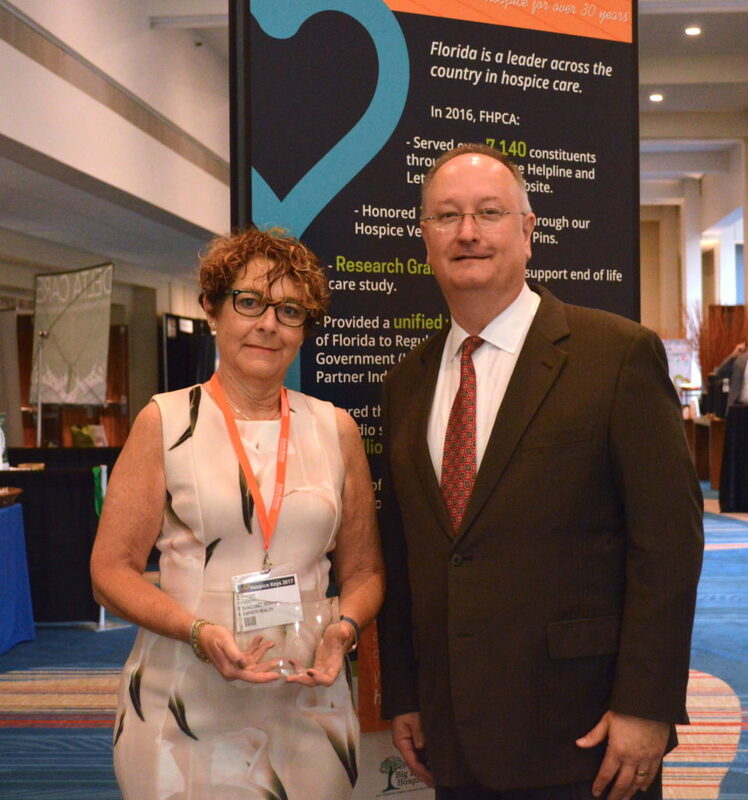 Florida Hospice & Palliative Care Association (FHPCA) announced the recipients of the Awards of Excellence in Hospice and Palliative Care at this year’s Forum. The Awards of Excellence program provides a venue for hospice professionals to honor their peers and highlight the very best hospice has to offer. 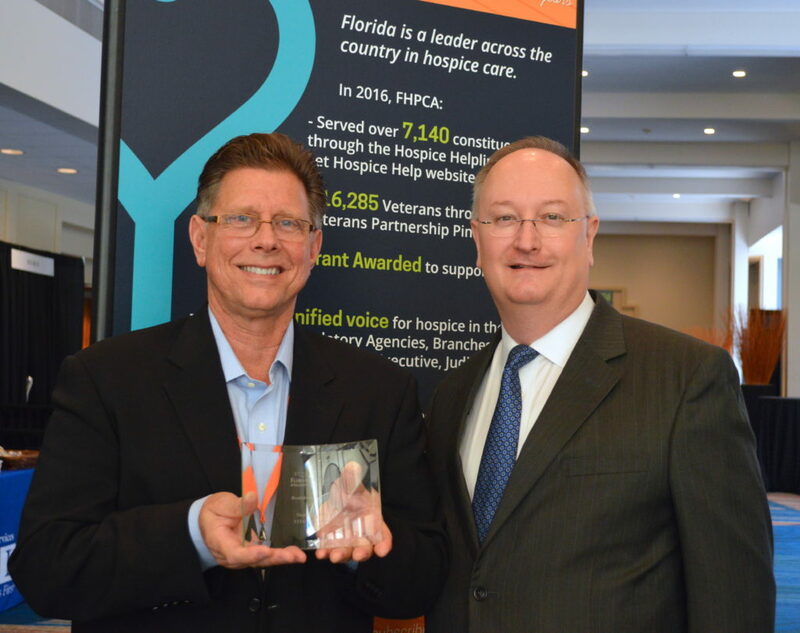 Recognizes an individual in any role within an organization who has consistently demonstrated leadership in forging the collaboration that makes hospice unique. This individual seeks excellence not only in his/her field, but also in cooperation with other disciplines. This individual fosters collaboration and brings teams together to the betterment of his/her organization. The Hospice Story Award is given to the person or organization that best captures his or her most meaningful hospice experience with original creative work. The award recognizes an individual in any role within a hospice organization who most creatively and effectively conveys what their hospice experience means to them. The story can be told from any viewpoint, be it spiritual, humorous, sensitive, reflective, inspiring, challenging, etc., and may use a variety of creative mediums. The award recognizes that the work of hospice is transformative and purposeful; changing not only those we serve but also those who serve. Excellence in program Innovation is a recognition of services and programs provided by a hospice organization that demonstrates the power of creativity and ingenuity to impact the practice and the community. Highlighting innovative services and programs through the Excellence in Program Innovation Award not only rewards the accomplishments of hospice programs but also challenges others to adapt inspirational ideas to their own programs and communities. Sharing and celebrating creative care establishes “best practices” that propel all of us forward. The “Traditions” program was created by Suncoast Hospice, a member of Empath Health, to increase the access to hospice services to underserved communities in their area, specifically African American, Hispanic, and Jewish communities, all of whom have historically underutilized hospice services. Suncoast utilized their Community Partnership Specialists to build relationships and establish trust with community leaders, faith-based organizations and various community groups. It was essential to bring various voices to the conversations in an effort to create presentations that were relevant to the needs of the community and addressed their perceptions about hospice care. Each Community Partnership Specialist was responsible for listening, creating, and ultimately implementing unique outreach strategies for each community. “Traditions” identifies the customary values of each community and uses it as a foundation to deliver effective outreach resulting in increased access to hospice services and the provision of culture-specific end-of-life care. The Breakthrough Awad recognizes an individual or team who, through their efforts to research and implement new ideas, has improved hospice care. Whether piloting a new program, streamlining a process or discovering a better way to provide a service, the recipient of this award advances the mission of hospice and provides a path for others to follow. Thomas A. Dalton has been in the field of music therapy for over 20 years and is a Board-Certified Music Therapist and a Licensed Mental Health Counselor in the state of Florida. He is a full-time employee of VITAS Healthcare in the Broward program and serves as the Senior Music Therapy and Music Therapy Internship Director. Thomas researched and developed the use of the Music Therapy and MIDI Protocol (MTMP) with hospice patients with Chronic Obstructive Pulmonary Disease (COPD). The inspiration for this project was based on Thomas’ work with COPD patients including working with his mother who is also struggling with COPD. The purpose of the study was to improve respiratory symptoms, well-being, and quality of life for patients in physical, emotional, psychosocial and spiritual domains. The Synergy Award recognizes a group of people in any role or configuration that has consistently demonstrated the ideals of collaboration and teamwork in working toward a goal or mission. This group not only seeks excellence within itself but also inspires excellence and collaboration throughout the hospice environment.